[55 Pages Pages] The market size for synthetic stem cells is expected to grow from USD 14 million in 2023 to USD 37 million by 2028, at a CAGR of 22.5% during the forecast period. The study involved four major activities in estimating the current market size for synthetic stem cells. Exhaustive secondary research was conducted to collect information on the market as well as its peer and parent markets. The next step was to validate these findings, assumptions, and sizing with industry experts across the value chain through primary research. The top-down approach was employed to estimate the complete market size. Thereafter, market breakdown and data triangulation were used to estimate the size of the segments and subsegments of the market. In the secondary research process, various secondary sources such as Hoovers, Bloomberg BusinessWeek, Forbes, and Dun & Bradstreet were referred to, to identify and collect information useful for this technical, market-oriented, and commercial study of the synthetic stem cells market. These secondary sources included annual reports, press releases & investor presentations of companies; white papers; certified publications; articles by recognized authors; gold standard & silver standard websites; food safety organizations; regulatory bodies; trade directories; and databases. Secondary research was mainly used to obtain key information about the industry’s supply chain, the total pool of key players, market classification, and segmentation, according to the industry trends to the bottom-most level and regional markets. It was also used to obtain information about the key developments from a market-oriented perspective. In the primary research process, various primary sources from both the supply and demand sides were interviewed to obtain qualitative and quantitative information for this report. The primary sources from the supply side include industry experts such as CEOs, vice presidents, marketing directors, technology and innovation directors, and related key executives from various key companies and organizations operating in the synthetic stem cells market. The primary sources from the demand side include scientists/researchers from academic & research institutes and government & private laboratories. Synthetic stem cells that could be used as therapy were identified through secondary research, and their market shares in the respective segments were determined through primary and secondary research. The procedure included extensive interviews with industry leaders such as CEOs, VPs, directors, and marketing executives for key insights. All percentage shares, splits, and breakdowns were determined using secondary sources and are verified through primary sources. After arriving at the overall market size from the market size estimation process explained above, the total market was split into several segments and subsegments. To complete the overall market engineering process and arrive at the exact statistics for all segments and subsegments, the data triangulation and market breakdown procedure was employed, wherever applicable. Data was triangulated by studying various factors and trends from industry experts. This research report categorizes the synthetic stem cells market based on application and region. 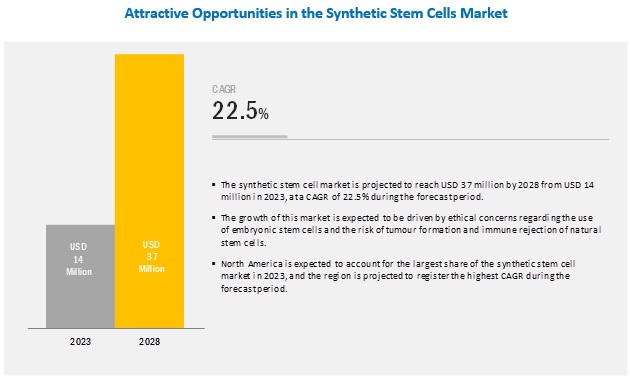 The market size for synthetic stem cells is expected to grow from USD 14 million in 2023 to USD 37 million by 2028, at a CAGR of 22.5% during the forecast period. The ethical concerns on the use of embryonic stem cells and the risk of tumor formation and immune response to natural stem cells are the key factors driving the growth of this market. By application, the cardiovascular diseases segment accounted for the largest share during the forecast period. The major applications of synthetic stem cells include cardiovascular diseases, neurological disorders, and other diseases that require regenerative therapy. Cardiovascular diseases have high prevalence across the globe. Currently, synthetic mesenchymal cells have been developed only for cardiac tissue and have been tested in mice models. The research on cardiac synthetic stem cells is expected to enter the clinical phase in the coming 2-3 years, and the first commercial product would be cardiac synthetic stem cells in the next five years. North America is estimated to account for the largest share of the market in 2023. This is majorly attributed to the rising research on stem cells in the region, coupled with public-private funding. The region is a global leader in the research on regenerative therapies such as stem cells and is backed by funding on advanced research infrastructure to commercialize novel regenerative therapies. Moreover, North America is the pioneer of synthetic stem cell technology and will be the early adopter of this technology in the coming years. The technology is developed and patented by North Carolina State University (NCSU) (US) and Zhengzhou University (China). What is synthetic stem cell technology? What could be the future of this technology in the coming years? What are the regional growth trends and the largest revenue-generating regions for synthetic stem cells? What are the major applications of synthetic stem cells?